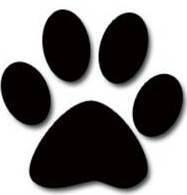 The Belle Mead Animal Hospital team is passionate about our clients and the animals we treat. We also value our clients’ opinions. Read below what others have shared, and feel free to submit your own client Testimonial by writing to CustomerService@bmvet.com (please add the word “Testimonial” in the subject line). I had a really good experience. The doctors and staff are caring and warm. Dr. White was wonderful with Annie, and I appreciated all she did to get Annie better. The follow up is great. I am very pleased with your hospital. Belle Mead Animal Hospital has the greatest vets – they have heart, soul, grace, and kindness, and they go the extra mile. The entire staff is amazing and the vets are unbelievable. They have brought two of my cats back from the brink of death and have helped them live for many, many years. 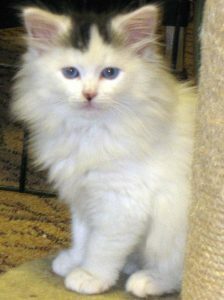 And they have done wonders for my new kitty, Whitby of Gryffyndor. 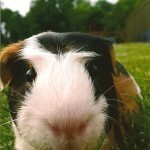 I can’t thank Belle Mead Animal Hospital enough! HAPPY 16th BIRTHDAY to RUSTY!    Good ol’ Rusty has been working really, really hard these last 8 weeks. He went to the (now previous) vet as he was limping. After they did x-rays, he came back to the room and couldn’t even walk. 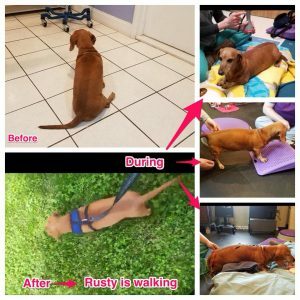 Thanks to Dachshund Rescue’s recommendation, we took Rusty the next day to Belle Mead Animal Hospital where Dr Somjen recommended PT, laser, acupuncture, and bedrest. Treatments initially were twice a week, then once a week, and now every other week. Well….it’s been amazing to watch him progress. Thank you Dr. Somjen and Tech Taylor! 5 stars x 2! – I have taken all my cats to Dr. Martins since 2003. My big tabby, Henry, had hideously swollen paws. I tried two other vets who were neither compassionate nor competent in my opinion. I went straight to Dr. Martins who had been highly recommended by my pet sitter. I knew I was in a different kind of veterinary hospital the minute I walked into Belle Mead Animal Hospital. 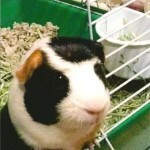 The staff was so friendly, and some of them talked to Henry, who was cowering in his cage. Dr. Martins took me on time. He played with Henry and petted him before he examined his paws. He diagnosed the condition immediately – plasma cell pododermatitis – and sent us home with doxycycline. Three weeks later, Henry’s paws were back to normal. I knew I’d found a vet who keeps up with research and truly LIKES his feline patients. I’ve taken 5 house cats and plenty of strays (for neutering). 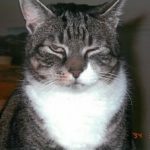 Sadly, 2 of my house cats passed away from cancer (Henry in 2010, one recently). Dr. Martins showed more compassion than any doctor I know (that includes MDs, and MDs treat PEOPLE!) and helped me accept the inevitable. He and his staff have been there for us as we gradually accept the loss of our “best boy” and our ongoing life with our other two wonderful cats. 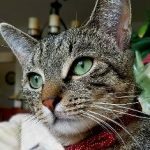 Belle Mead Animal Hospital has been caring for my cats for the last 20 years. And each of their lives have been saved by the expertise, knowledge, and compassion shown by Dr. Martins, Dr. Stephens, Dr. Buonocore, Dr. White, Dr. Rockhill and Dr. Pascetta. 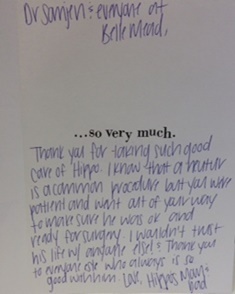 The vet techs and staff at Belle Mead are all of the highest caliber. 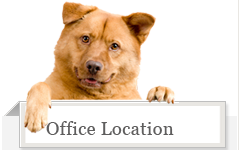 From the moment you walk through the door they welcome you and your pet with warmth and friendliness. You are treated with patience and respect. The doctors and staff have that rare understanding of the strong bond between people and their feline/canine children. 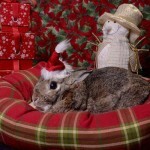 This enables them to listen and sympathize with the concerns and endless questions of the worried pet owner/parent. To anyone who brings their animal to The Belle Mead Animal Hospital, be reassured. The cure, the answer, the miracle of restoring your animal to optimum health lies in the capable hands of the doctors and staff at this amazing hospital. I have been a client of Belle Mead Animal Hospital for thirteen years now, and I’ve been extremely happy. 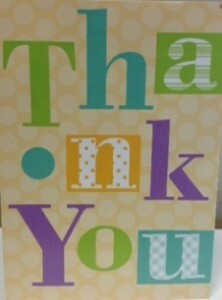 I find the staff to be caring, thoughtful and gracious. I usually see Dr. Martins or Dr. Stephens, and I have never had a problem. Even when my one cat Samson passed away, I found everyone to be so understanding and sympathetic. I continue to take my cat Emma in to see the doctors there, and I’m very satisfied. We would like to share our heartfelt appreciation to each of you for your care, love and special attention you all provided Viking. He was our best friend for 15 years, and while we miss him greatly, we remember all the laughs, fun and joy he gave us all. Thank you for all your compassion and care you provided Viking. 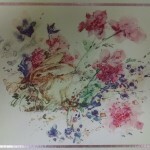 I wanted to say thanks for the beautiful card you sent – it meant a lot to us. But mostly, thanks for the time as Toki’s vet. It was 5 years ago this month you performed her “hysterectomy.” Over the years through all the checkups, growing teeth, and other things, I appreciate you treating me with respect as a nurse and including me in discussions of treatment. This year was a challenge, but your bubbly personality and enthusiasm showed me you really enjoy what you do, and you’re very good at it. We were very lucky to have you as Toki’s vet. Your warmth on that last excruciating day was wonderful. Taking her home for a few hours was definitely the right thing to do. We all got to be with her in her home and say goodbye. I’ve included a picture for the wall of “patients.” Thanks again for everything. 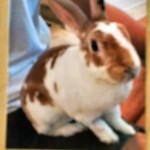 You all have been a huge part of my life by helping me care for my most precious loves (prior to Charlie Brown, there was Brownie, Baxter, Zahra, and numerous beloved foster bunnies), and thus a huge source of peace of mind. He (Charlie Brown) did have a good life; part of that was thanks to me, but another very important part of that was thanks to those at BMAH who always did the best for him and treated him with love and care. He was ailing for a while, and I would not want him to live a minute longer than necessary if he had to live in pain or severe discomfort. Nevertheless, our hearts are broken that he is no longer with us. When I came to BMAH to pick up his ashes, I felt another wave of sadness because I have developed a true bond and friendship with all of you there over the past decade, and now I no longer have a legitimate reason to stop by. We want to thank you for all the love and care you gave Seph over the last year. 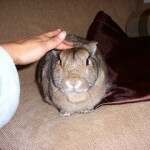 He was such a special part of our lives and really made our house revolve around him and his charm. I think he looked forward to his almost weekly and sometimes twice a week visits to your office and all the extra cuddles he would get. It is comforting to know that you were always there to see him and help him whatever way you could on his road to recovery. Your care and compassion has helped us through this difficult time. Seph spent most of his last night in my arms and waited for Jackie to get home where he was for his last moments with lots of love from all of us. 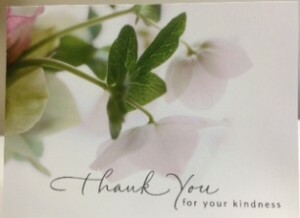 Thank you for your card and all the kind words. You all helped Seph enjoy all his time with us. Thought you would like a few pictures of Seph that show his sweet spoiled life. Thank you for everything. Indy, my Bengal cat, had 8 teeth removed at your office last week. During surgery, Dr. Martins told me that when he arrived home he would be a different cat…..BOY, IS HE EVER! 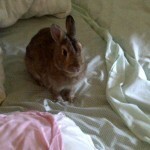 Indy is dancing and trotting around the house, and is lovey-dovey to the point of ridiculous!! What a happy boy!! Thank you. Thank you. Thank you!! 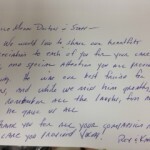 Wanted to share a great review and a big thank you to Dr. Martins and all the staff at Belle Meade Animal Hospital. I recently was in a very difficult situation with my rescue dogs that I have owned for over 10 yrs. My Pomeranian mix recently went completely blind a few months ago but has been functioning well. She recently bumped into my Shih Tzu who didn’t like it very much and they got into a serious altercation resulting in my Shih Tzu completely losing his right eye. I was beside myself emotionally. My Shih Tzu remained hospitalized at Animerge for 2 days and they were able to save the eye, but he will be completely blind. I knew I couldn’t have the 2 dogs in the same area ever again. I was devastated to say the least and was overwhelmed with the task of what to do next. Dr. Martins, feeling my pain and anxiety took my Pomeranian, who he just helped overcome her serious medical condition as well, and boarded her for me for 2 entire weeks, so that I could bring my Shih Tzu home and allow him to recover after eye surgery in peace. Dr. Martins knew how anxious I was and checked in with me every day. He and his wonderful vet techs took pictures of Vera and sent them to my cell phone almost on a daily basis to make sure that I knew she was ok. To make a long story short, my Shih Tzu healed just fine and is functioning in spite of his one eye blindness. If all this wasn’t wonderful enough, Dr. Martins personally brought my Pomeranian home and did a consult in my home to teach me and my family how to decrease the dogs’ anxiety and to sustain peace in my home. I will mention that I also have a “crazy” lab mix, whose energy is through the roof at times and makes the other 2 dogs even more anxious. After the consultation training session I was shocked and amazed what Dr. Martins was able to accomplish with the 3 dogs. I am happy to say that I have continued the training sessions daily and my home is a different place with 3 dogs that actually listen, are no longer anxious and I am an owner that will be eternally grateful for all that Dr. Martins and all the staff at Belle Meade Animal Hospital did for me. I would recommend that if you have any kind of pet that needs care, don’t go anywhere else but Belle Meade Animal Hospital!! We lost our beloved dog George about one year ago to cancer. Belle Meade Animal Hospital was very compassionate during that time. They helped us understand our options without pushing and treated all of us in a caring, thoughtful manner. Now we have our Sarah Ann a goldendoodle who was born in October of 2014. From the very first puppy visit, she has been going to Belle Meade Animal Hospital and most visits have been with Dr. Martins. 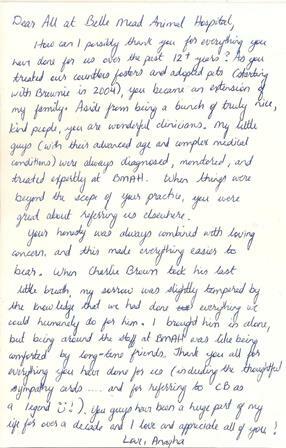 Dr. Martins is an amazing veterinarian whose love for animals is so very evident. He greets Sarah every time with enthusiasm and genuine friendliness. She loves him. He is very good at returning calls or following up with results on lab work, etc. 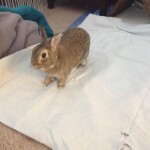 He did Sarah’s spaying, and we would trust him for any other surgeries she may need in the future. He never rushes our appointments. Dr. Martins is very knowledgeable about training dogs, and we have found his input very helpful in training our dog. 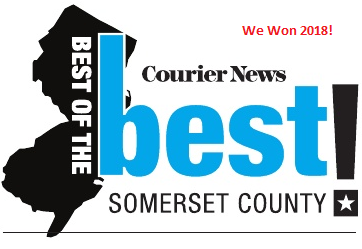 I am senior citizen from Somerset County and for the past 9 years I have taken my cats to Dr. Martins at Belle Mead Animal Hospital. The staff is helpful and courteous over the phone and in person. Dr. Martins is very kind and caring when dealing with my pets. He is extremely thorough when explaining the treatments and options to me. 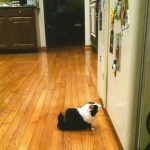 I would recommend him to anyone who has a pet. From our guinea pigs, rabbits, to our cats to our dogs, our multi-pet home is always welcomed like family when we’re at Belle Mead Animal Hospital! Shiloh, Lauren, Joannie, Jerry, Rachel and Grace are just a few of the names that immediately come to mind from the years of loving care given to our pets. The way they know my pet, make efforts to comfort both my family and our animals, can never be repaid. Dr. Martins goes above and beyond to give expert care to his patients and educate their owners. His passion to help beyond his exam room into the lives of his patients and into the community is endless. 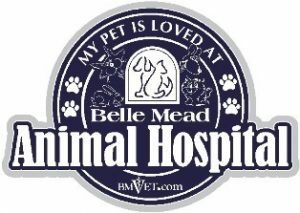 The team at Belle Mead Animal Hospital gives 100,000% dedication in the most animal loving veterinary hospital I have ever had the pleasure to recommend. I hope they never move…we’d have to move with them! 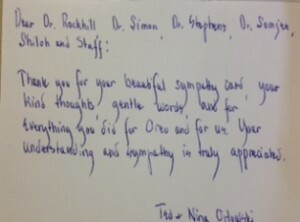 Dear Dr. Rockhill, Dr. Simon, Dr. Stephens, Dr. Somjen, Shiloh and Staff, Thank you for your beautiful sympathy card, your kind thoughts, your gentle words, and for everything you did for Oreo and for us. 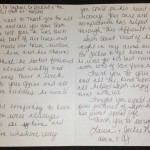 Your understanding and sympathy is truly appreciated. The Belle Mead Animal Hospital in Hillsborough, NJ is simply one of the best to which I have ever taken my pet rats and my cats. 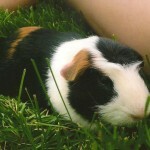 I have lived in several different states and finding competent care for an exotic is a real challenge. After moving to New Jersey I was lucky enough to find Dr. Kim Somjen at Belle Mead. 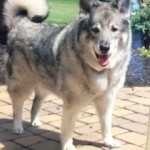 Dr. Somjen is extremely knowledgeable about exotics, with a wonderful ability to diagnose issues and recommend the treatment that is best for my pet. The staff overall are exceptional, and have never failed to squeeze me in when in need. The rates are very reasonable (trust me) for the exceptional care provided by this clinic. I travel an hour to bring my pets to them and it is well worth it. Exotic pet owners (of which I am one): There are numerous veterinary practices to choose from in our community BUT when we ask The Question:“do you treat exotics?” The answer usually is “no, I’m sorry we don’t”or at best, “we don’t see a lot of exotics”…that is Not the case at Belle Mead where several associates do take our kind of pets very seriously and are experts in the care and health maintenance of exotics and what are more daintily referred to as “pocket pets.” We’re talking mammals to marsupials: mice, rats, guinea pigs, sugar gliders, ferrets, chinchillas and their furry (or hairless) kin…as well as pet goats, pigs and so on! 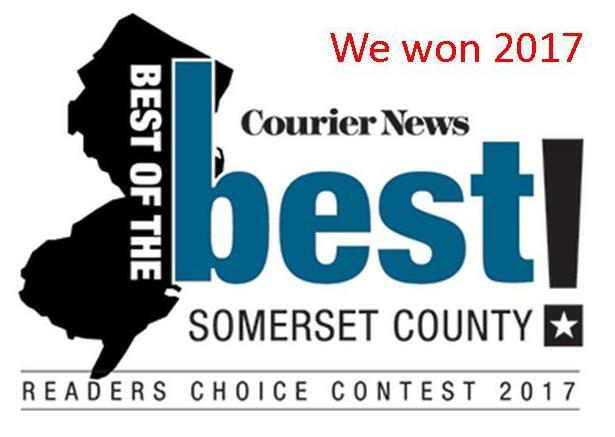 Specifically, Dr. Kim Somjen has been our family’s go-to vet for several years. Experienced, capable, always researching the newest and/or best treatments, Dr. Somjen instinctively knows how to provide the best medical care for our pets and does so with the compassion of a fellow animal lover. Dr Martins saved my cat’s life! 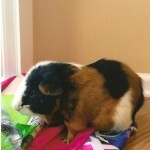 New to the area in 2012 I decided to establish care at Belle Meade. I met with Dr Martins who didn’t just discuss what tests and care my cat, Hudson-needed, he sat with me and discussed what my goals of care were for Hudson. Hudsons a 3 time rescued shelter kitty-I feel it’s my job to ensure the rest of his life is as comfortable and stress free as possible. Hudson needed a teeth cleaning so blood work was done to ensure it was safe to give him sedation. The procedure had to be delayed a few weeks,so the day of the cleaning blood work was repeated. Dr Martins called-Hudson’s blood sugar was “very high”,he felt it was still safe for him to get the procedure (maybe a underlying infection was raising the blood sugar) but there was no doubt-Hudson had Diabetes. Dr Martins discussed managing this with diet changes and Insulin and assured me we might be lucky-the Diabetes may have been caught in a early stage (as previous blood sugars were normal) I’d been told Hudson was about 14 years old when I adopted him-I assumed his tendency to take long naps/not be so active was due to aging. Dr Martins felt it could have been early signs of the Diabetes. And boy was he right! 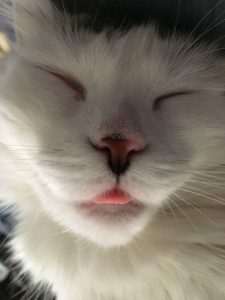 living proof that Feline Diabetes can be controlled-and that a good Vet who is up to date with current research-who listens to and discusses and involves owners in their pet’s care-can change a Cat’s(and his owner’s) life for the better. 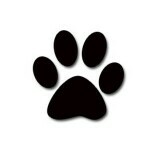 Belle Mead Animal Hospital is the best animal hospital because the doctors and staff are dedicated to their work. The hospital is always spotlessly clean and the receptionist staff greets every client by name (whether human or canine!) The doctors and techs there have only one goal: to cure each animal that walks or is carried through their door. This is a hospital where the medical staff is doing what they were born to do: save the lives of innocent animals.